Corrosion in the fire protection industry has raised concerns in recent years. Corrosion in fire sprinkler systems can cause system failure/malfunction, facility downtime, and occupational hazards. Until nitrogen based inerting strategies were introduced, there were several products that claimed to control corrosion in fire sprinkler systems - but zero products to eliminate it. By using a nitrogen generator in conjunction with a vent to purge the pipe network of the corrosive oxygen gas, corrosion in the system can be effectively stopped. 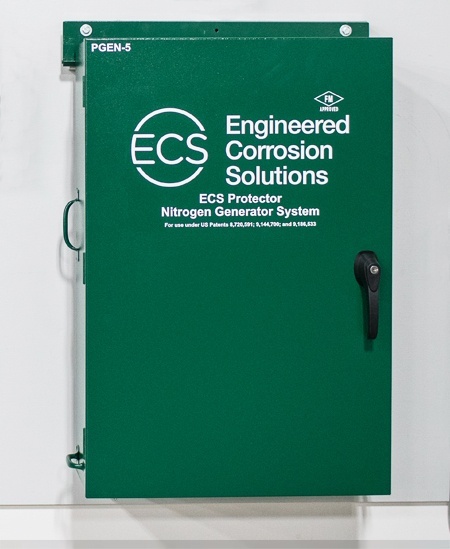 In this guide, we’ll be taking a closer look at what causes corrosion in dry sprinkler systems – and the ECS nitrogen generator systems that stop corrosion in its tracks. The primary cause of corrosion in all fire sprinkler systems is oxygen. Whenever oxygen, liquid water and steel are in close contact, a chemical reaction takes place which causes the iron to bond with oxygen, creating iron-oxide. If you have experience with fire sprinkler systems you know that all fire sprinkler systems – even dry and pre-action – contain all three elements necessary for corrosion to occur. The chemical reaction needed for oxygen corrosion to occur involves an electron donor (steel sprinkler pipe), an electron acceptor (oxygen), and an electrolyte (water). When raw iron ore is transformed into fire sprinkler pipe it is taken from a low energy state to a high energy state by adding an electron. At the high energy state the steel is less stable then it was previously. The laws of nature dictate that all energy moves towards a lower energy state. Therefore, the steel is seeking an opportunity to give up an electron and return to a lower energy state. 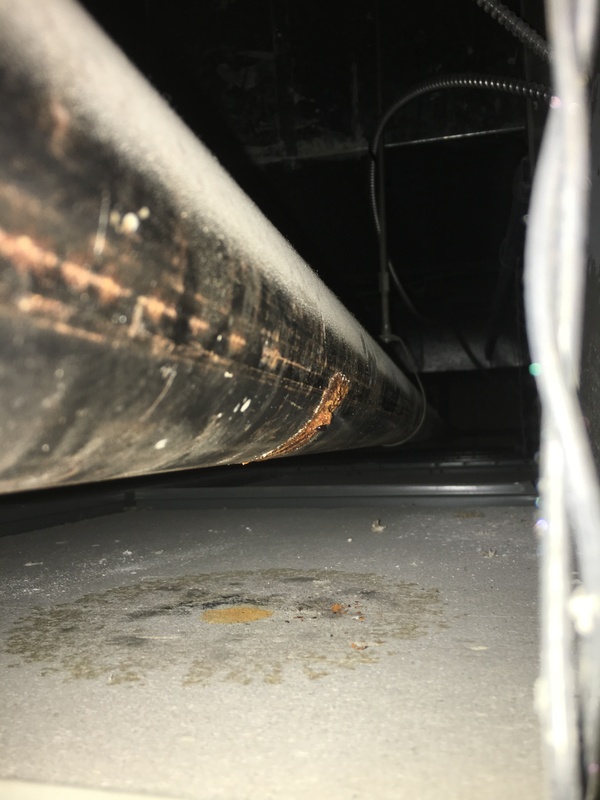 When the steel sprinkler pipe is put in close proximity of liquid water and oxygen this reaction occurs – and corrosion takes place. Myth #1 – MIC (Microbiological Influenced Corrosion) is the primary cause of leaks in fire sprinkler systems. Myth #2 – Bad Water causes fire sprinkler system leaks. Almost all fire supply water comes from fresh, clean municipal water supplies that are not chemically corrosive within the temperatures and pressures to which a fire sprinkler system would be exposed. Myth #3 – Material Defective Sprinkler Pipe causes leaks, particularly at the weld seam. Pipe materials used today meet or exceed ASTM requirements incorporated in NFPA 13. Root cause analysis very rarely identifies material defect as the cause of failure. Myth #4 – Galvanized pipe provides better internal corrosion protection than black steel pipe. All systems, even dry and pre-action, will trap water. When a galvanized surface is subject to persistent moisture, such as an accumulation of water, it will detach from the base metal and leave the steel exposed. Once the steel is exposed all of the oxygen available to react will preferentially corrode the exposed steel resulting in an accelerated leak. Myth #5 – Sprinkler systems with frequent leaks must be completely replaced. Oxygen corrosion in fire sprinkler systems requires that oxygen, liquid water and steel pipe be in close proximity; corrosion is highly localized at air/water interfaces. On average, only 20% of system piping shows significant signs of corrosion. Using nitrogen as the source of supervisory gas in a dry pipe or pre-action fire sprinkler system will eliminate corrosion due to the lack of oxygen to support the corrosion reaction. The use of nitrogen as a supervisory gas has been approved by NFPA 13 (Section 7.2.6.1) and FM Global Data Sheet 2-1: Corrosion in Automatic Sprinkler Systems (Section 3.2, April 2018). An economical way of providing a reliable source of nitrogen is with the use of a nitrogen generator. A nitrogen generator makes 98% nitrogen by taking compressed air that is 78% nitrogen, 21% oxygen and other trace gases and separating it. 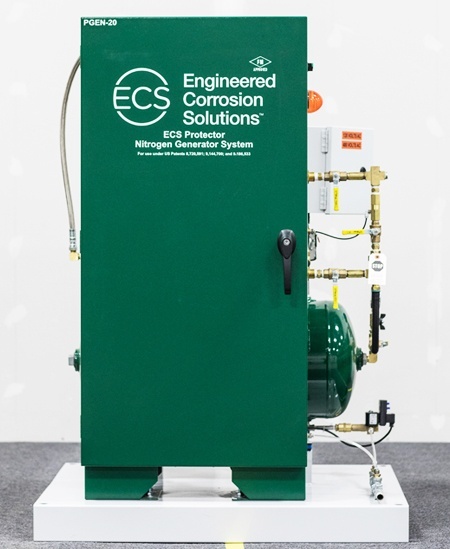 ECS nitrogen generators achieve this by using membrane separation technology. 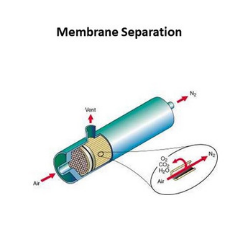 A nitrogen membrane separator contains thousands of hollow fibers constructed of a porous membrane material. This membrane material can take a feed stream of compressed air and separate nitrogen from other gases such as oxygen, carbon dioxide and water vapor based on molecular size. 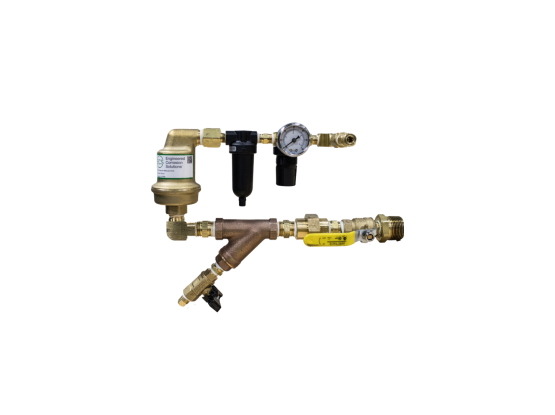 ECS accomplishes the goal of removing oxygen from dry pipe sprinkler systems using fill and purge breathing, a patented pressure cycling process. 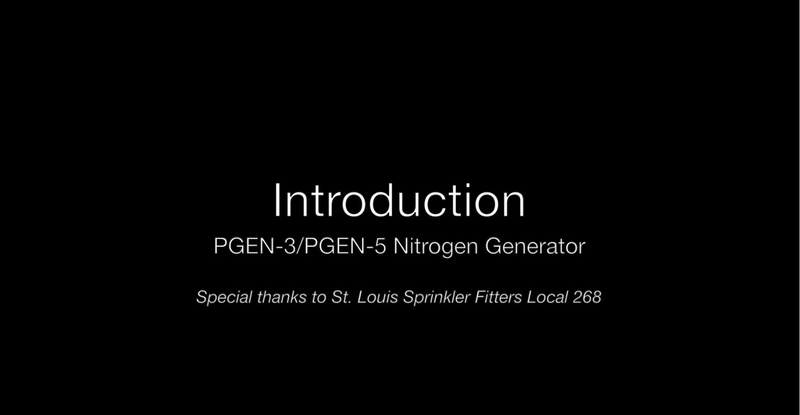 This process is electronically controlled by the nitrogen generator and occurs automatically while the fire sprinkler system remains in service. By design, fill and purge breathing does not impact the ability of the system to respond to a fire. 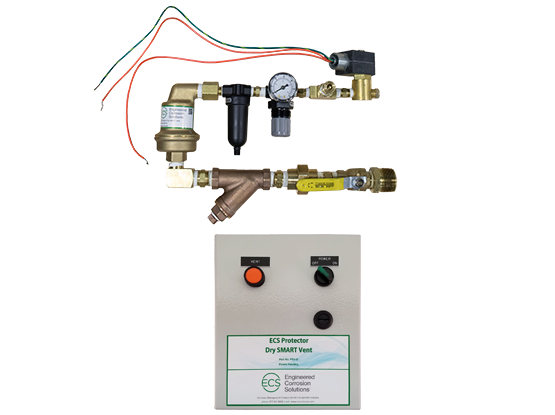 Fill and purge works by using a small pressure range (3-5 psi) to pressure cycle the system until all oxygen gas is removed. This small pressure differential creates sufficient gas mixing within the system such that the piping network acts as a tank or pressure vessel. Each sequential fill and purge breathing cycle dilutes the concentration of oxygen further and enriches the concentration of nitrogen gas in the piping network. 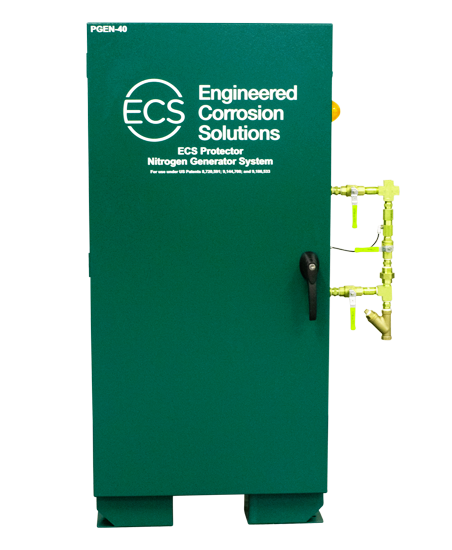 Through extensive testing and empirical trials, ECS concluded that the oxygen removal vent could be located anywhere on the system and achieve the same result of 98% nitrogen gas throughout the system within 14 days. 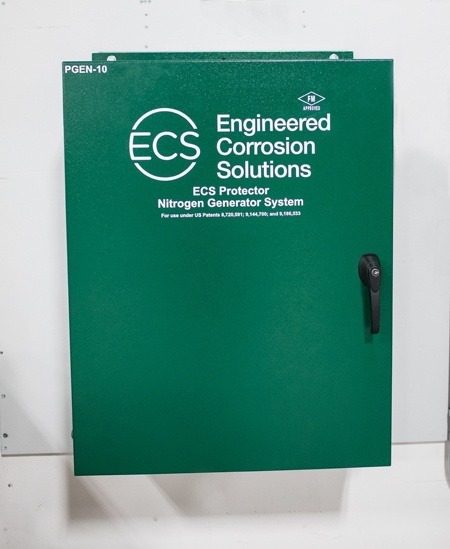 The implementation of a nitrogen-based corrosion control strategy, even on an existing system that has experienced corrosion, can dramatically extend the useful service life of the system. 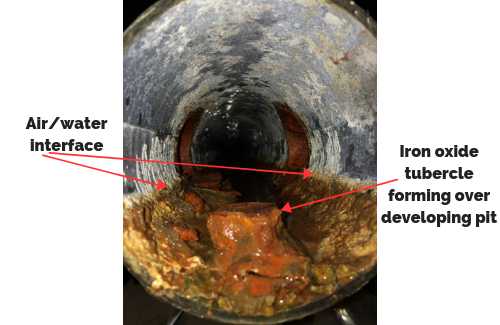 If a full corrosion management plan is adopted and damaged pipe is identified and replaced first, the resulting system life will extend far beyond the expected life of the building. Combined with the installation of an oxygen removal vent and the patented fill and purge process, the use of a nitrogen generator on a dry system ensures that oxygen is removed from the system and its reintroduction is kept to a minimum. Learn more about our nitrogen generators below. 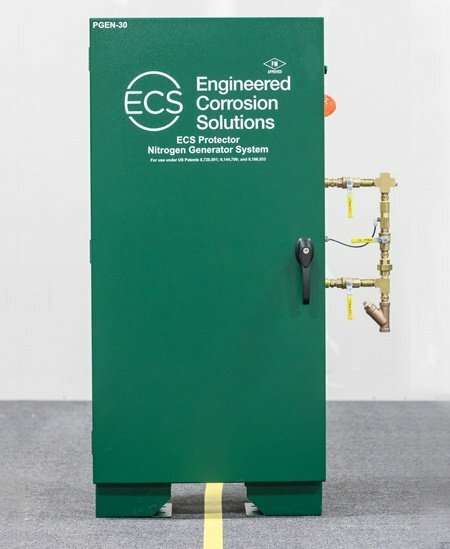 ECS nitrogen generators are designed specifically for fire protection systems to meet the growing industry need for corrosion management. Our innovations and patented technologies provide a permanent solution to mitigate corrosion in dry-pipe and pre-action fire sprinkler systems. Small to medium projects can generally be supplied with a pre-engineered nitrogen generator that includes an integral air compressor (PGEN-3/5/10/20). 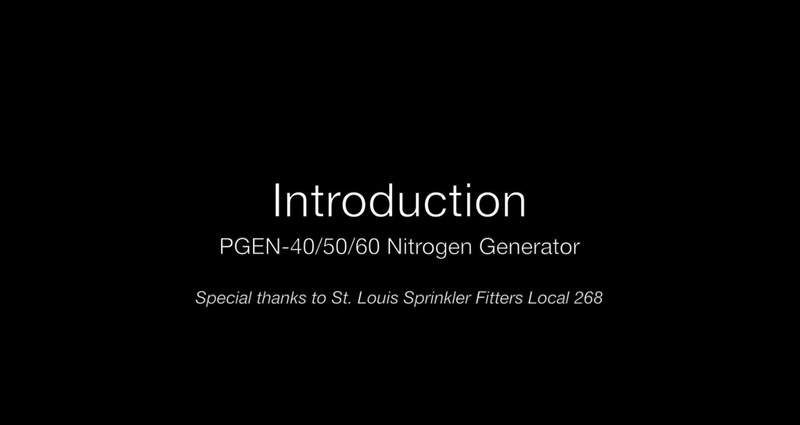 Projects with a larger cumulative sprinkler system capacity should be supplied with an engineered stand-alone nitrogen generator paired with a separate air compressor or house air (PGEN-30/40/50/60). Capacity – Up to 2,000 gallons of sprinkler volume for wall mounts and 3,200 gallons for skid mounts. Storage – Wall mount generators do not require any floor space. If your project is too big for a wall mount generator, the ECS skid mount generator (PGEN-20) is a compact, pre-engineered solution. Optimal project types – These generators are a great fit for many small to medium projects. Whether the project consists of a small data center or converting an assisted living facility anti-freeze system to a dry system, the wall-mount series has demonstrated exceptional performance while requiring minimal installation time and space. Capacity – Up to 22,500 gallons of sprinkler volume. 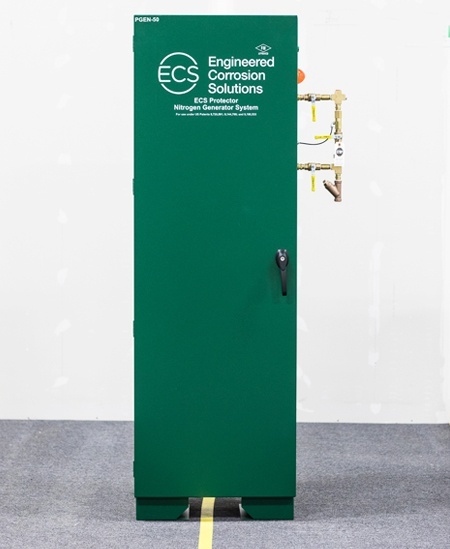 Storage – The largest ECS stand-alone nitrogen generator only requires two square feet of floor space. Optimal locations – These generators are a great fit for large data centers, cold storage applications, or large parking garages. A nitrogen generator system for dry pipe and pre-action fire sprinkler systems is not complete without a venting device. The primary function of a dry system vent is to allow removal of corrosive oxygen from the fire sprinkler system. Without a vent, the nitrogen generator will only provide high purity nitrogen gas as the system depressurizes through natural system leakage, allowing the oxygen trapped inside to continue to corrode for 90 to 120 days before being consumed. By comparison, a fire sprinkler system with a nitrogen generator and a vent will completely remove oxygen in 14 days or less, offering a significant benefit in corrosion control. We offer two different models of dry system vents to remove oxygen from the fire sprinkler system. The ECS Protector Dry Manual Vent (PAV-D) offers a lower upfront cost and does not require any electrical connections. The ECS Protector Dry SMART Vent (PSV-D) offers more functionality and automation, closing automatically in 14 days once the sprinkler system reaches the desired concentration. Both vents are installed at the fire sprinkler riser and facilitate the fill and purge breathing process. We do not sell equipment through traditional fire sprinkler distribution channels. This means that our project engineers can work alongside your teams to provide system design and product selection assistance for every project. ECS generators are quick to install, operate and maintain. We do not require nitrogen storage tanks or air dryers. Our wall mount nitrogen generator series requires no floor space and can serve up to 2,000 gallons of total system volume while meeting the NFPA 13 fill requirement for up to 1,120 gallons. They are not required to be located at the end of the dry or preaction system. This saves time and money when installing and maintaining the system. 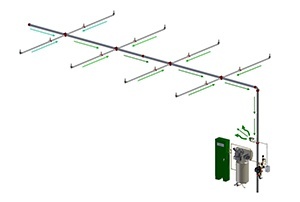 No longer will you be required to coordinate power to the end of the system for an electronic vent or run tubing from the end of the system to the valve room for a gas analyzer. With ECS equipment everything is installed in the riser room. We guarantee that all orders are processed and shipped within 72 hours of receipt of an order. There is no need to go through traditional fire sprinkler distribution channels.